Tonight he ate a little better for me. He seemed to favor the berry/banana powder, pollen, greensand, new plant mix consisting mainly of wodesorel's Wo'pourri and a little bit of silkworm/daphnia/chia mix. 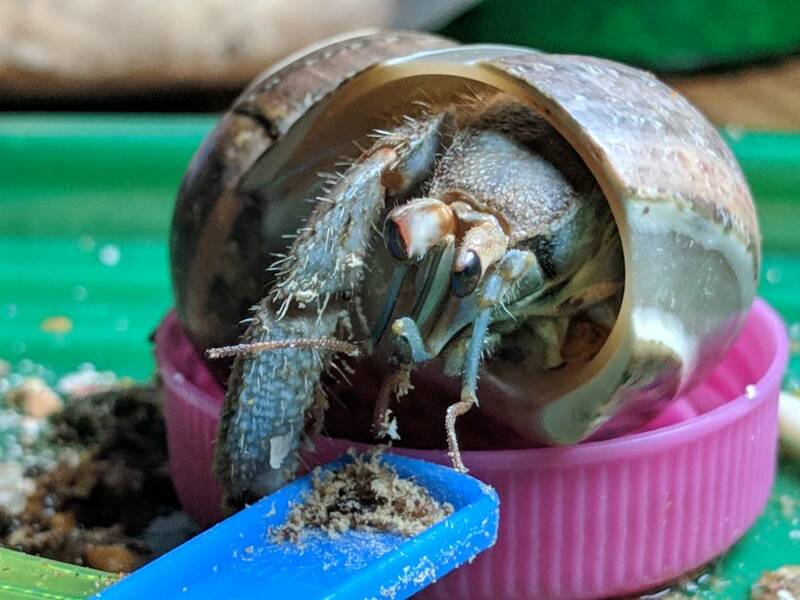 He refused kelp, crickets, crab exo, and powdered whole eggs. I believe I finally see a gel limb forming out of his rear left leg nub. It is only about 1/8" long. There may be more forming but are very tough to see. I started to change his baths up a little bit. I let him soak in less than 1" of water for a few minutes. 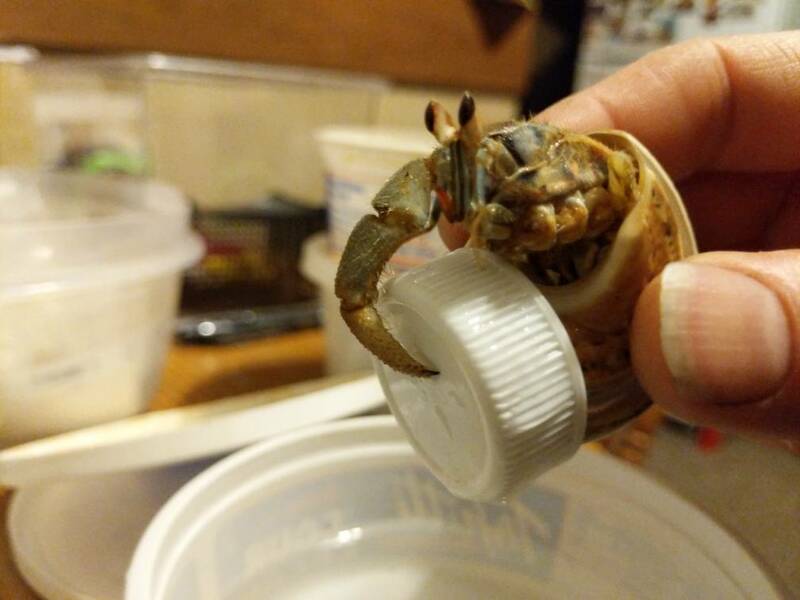 Then I started to prop him up on a bottle cap so he can still reach down to drink without being partially submerged. When I was getting him out of the water he wanted to hold on to his cap! Such a little sweetheart! He’s captured my heart, for sure! Thanks Stacy! You're the best! We are all hoping he makes a full recovery. I'm sure Eddie will love the foods! Now I understand how tired you were with caring for all the zoea hours a day. By the time I'm done with Eddie and the other crabs it's late. He has me a nervous wreck! I have my one Wyze cam set up on the Crabby Hospital so I can check up on him while I'm at work. Today he only spun like a half turn in his little ISO. Other days he at least will move from place to place. I'm really hoping he goes for a molt before I need to travel for work at the end of the month. Luckily it is only for a few days. Lol he is so cute! I hope he molts soon! I'm thinking he may be ready for a molt hopefully next week. I' hoping to see more gel limbs form in the next few days. Then it won't be long. 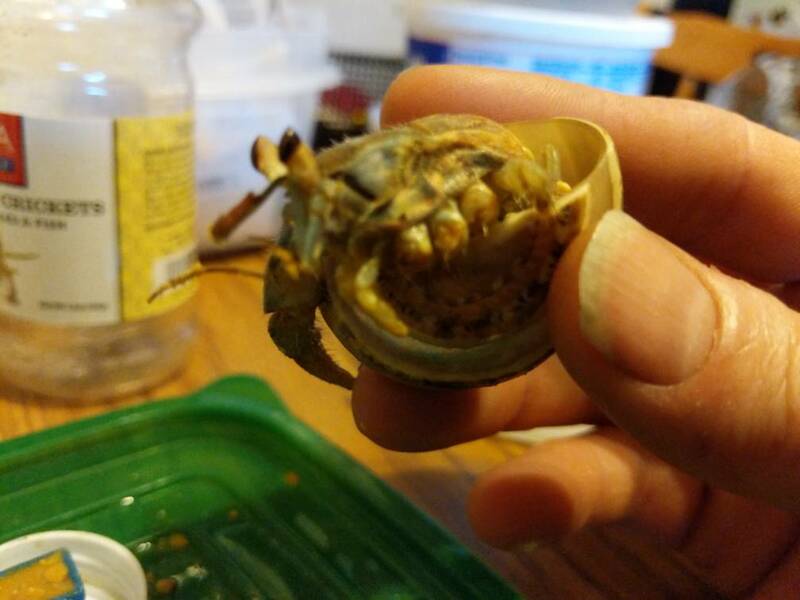 Eddie, named after Iron Maiden's mascot, is one of our favorite crabs since we got him. He seems to have a mellow laid back personality. I also think he was our first crab to find and use a wheel. He is always super fast, we call him our racing crab! Good news this morning. I picked him up to tend to him. Unkown to me when I picked him up he pooped last light and I unkowingly got it on my finger. That's probably the happiest I ever will be to get a turd on my finger! He didn't eat very much at all this morning. Hopefully tonight's feeding will be better! Yw! Funny about the poo! I have been offering him bee pollen at every feeding. Honey at least at his nightly feeding and also have them available to him in his ISO as well. Eddie's feeding went well again tonight. Pretty much the time from my last post above until now is how long it takes me/him, us. He ate a little of just about everything. Bee pollen, chicken gammarus shrimp,calci worms, beef liver, Azomite, brine shrimp eggs, fish bone mix, and plant mix #2. Since the raw honey is very think I mixed in some coconut oil and added some crushed dehydrated cranberries, he seemed to really enjoy that mix. Tonight he only refused crab exo, and smelt. I changed up his baths slightly tonight and it seemed to help him eat more. I did his salt water bath first. Then I started feeding him. He would pick at maybe 2-3 items then just sit there. I put him in his fresh water bath for a minute or so then feed him again, then repeated the fresh bath process again. Once his feeding time's done I let him continue his fresh soak while I change his foods in the ISO tank. This process seemed to help him have more interest in the food. I'm thinking e's don't drink much salt water so after eating dried powder they can't process it as easily. After drinking some fresh water it allows him to eat easier. I'm not sure just my thoughts on Eddie's behavior to me. Eddie always seems to prefer eating during his nightly feeding compared to mornings. It may be because I can only spend 15-20 minutes max with him before work. He picks at some stuff but not as enthusiastic compared to at night. I did manage to prop him up on a bottle cap and take some really good close, "glamor" shots of him last night. I'll try and get good video of him tearing into his food. 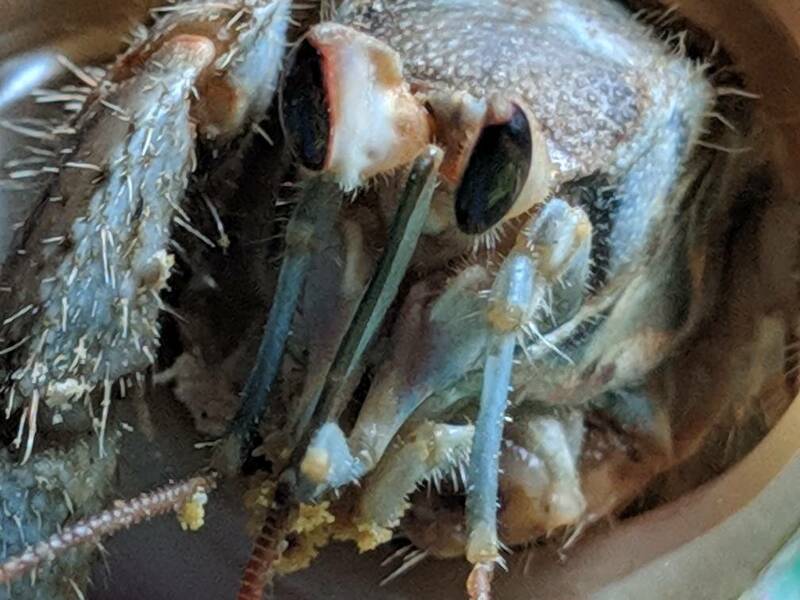 It is really cool being able to see them use thier mouth parts to eat. It's something everyone should see. Wow! Those are some beautiful pictures!!! Eddie is love, love, loving the care goodies! 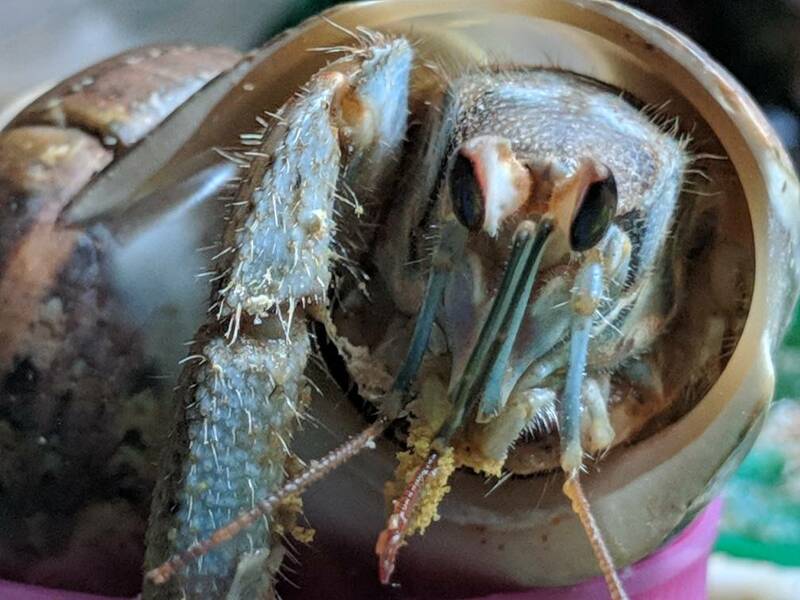 Here are two videos of him chowing down on the Ground Krill, and Crawfish Meat! Thank you again from Xeno, Eddie, and myself. Great video! I’m glad he likes those! I hope he likes the other items as well! Yw! Love your videos! So awesome seeing him eat that close up.